Words cannot convey the disappointment I had while playing this game. If you played the demo, forget that you did. It’s nothing like the regular game. While playing it, it felt like some kind of prototype for the next game announcement. “See what we did, and NOW DA DA DUH DA! We’ve made it better.” If you do any amount of research you’ll see virtually every review saying the same thing but we’re not ones to take serious writers reviews too serious. So here’s my serious review. That you too cannot take seriously. Bewm. Good: The story. I think I’d be equally as happy just watching the cutscene’s than actually playing the game. Ouch. Man. I felt that burn and I’m writing this. 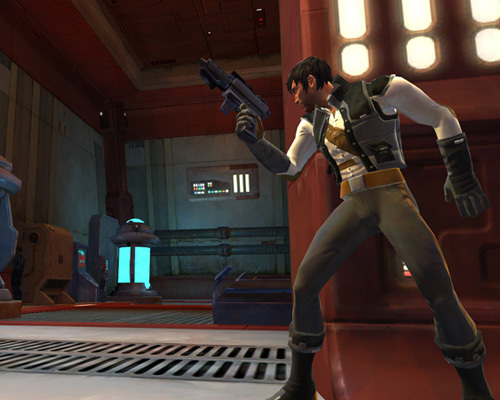 The ability to put you in a jedi’s shoes are there so at times you’ll really enjoy blasting people with force powers. It’s there not for all the levels but there are moments. And those moments are wonderful. You’ve got a force push that is pretty killer and force throw. You’ll most likely use these all the time. The game is deceptive in that it drops you in as vadar, and you totally destroy wookies. You can level up in game and further boost your powers as well. So in a sense it’s rpg. Bad: That was probably the hardest good I’ve ever had to write. Because of so many “buts” that I can put in. The leveling up is cool but you max out everything just through the process of leveling up. So why level up at all? The mobs leveling up too? Yeah. They do but not like obvilion, they’re just always equally as powerful as a jedi. The boss fights are easily the worst elements of game-play. You are force to do button sequences, and if you play like i do, in a cave, in the dark, drunk and one eyed open you’ll find it hard to execute these. If you do happen to execute a few in a row, then you’ll find another set of button mashing sequences. So, if you miss these the process starts over completely and frustration enters the room. Ugly: For all the talk of a destructible world, it’s just not there. You see clearly the pieces you can pick up. Sure boxes and stormtrooper picking up is cool, and throwing them in the same manner (and not killing them to boot) for the 200th time gets boring VERY FAST. Fighting a rancor, 10 times, not fun. 5 times? ok. Putting out content for the WII, and not for the ps3 and xbox 360 THEN selling it. Not cool. There’s a new Star Wars game coming out and no, it’s not Battlefront 3. It looks like it’s coming to all platforms too. So, at first glance from the video on their site it looks to be a more simplified version of Star Wars Force Unleashed. Is that a good thing? Problem be it may. Worried we are. hmmmmmmmmmmm. The 3rd! Master Control Cast. We talk about achievements, lost and damned, world of warcraft, sega genesis,star wars force unleashed and the touchy subject that is the horror movie Eden Lake. Stay tuned for the 3rd podcast! February 28, 2009 Posted by lurkerbelow | The Master Control Cast	| Eden lake, GTA, Master Control Cast, podcast, Sega, star wars, warcraft | Comments Off on 3rd Podcast!